@Boat Quay | Get Your Grub On! I think it wasn’t even a week since I’d bean here but after another late yoga session i was magically drawn back into this place. The initial idea was to just have some simple cold somen but glimpsing through the menu and chatting with the guys I quickly came up with a much more complex plan. Ordering a round of sushi was the start – a wonderful soft Hotate Abury (seared scallop) topped with some tangy mayonnaise, delicious top grade Sake Sushi (salmon) and my first take on some ugly as looking but truly life-changing Anago (sea eel), all so big, covering the rice completely underneath. Mentioning that I wanted to have the Somen, one of the gentlemen recommended me a special version of the Sakane Soba instead. These were magnificently unfamiliar and being made from fish meat gave the noodles a unique flavour and crazy fish-like texture too. The chef topped it all with a thin, melt-in-my-mouth slice of Ohmi Wagyu working just fine with the soba and the strong dashi broth. They were also so nice to let me take part in the last course of their Omakase customers’ dinner and gave me a refreshing and lightly sour Ume Jelly ON THA HOUSE. Great day end that one was, thanks. These doors are made to open. It gotten pretty late at the office and I just had finished one of the last yoga sessions of the day realising that way past 9 p.m. healthy dinner options thin out. I remembered that six months old Japanese restaurant next door which I had recognised first during its’ opening week when all the flower bouquets were lined up in front. I pushed aside the little sliding door at the entrance, it was still open, SCORE! It was totally empty and everyone was already cleaning up but they waved me in with a smile and guided me to take a seat. Sitting at their bar it felt like ages ago that I had proper sushi and it suddenly turned out that I had missed it a lot actually. Therefore I ordered me a generous portion of delicious Maguro Sashimi (tuna), soft and chill, unfortunately a bit stringy at bits as well. Proteins done but I still had to secure my carbo intake and it seemed like that Tekka Don could do a great job. The fish was from the same cut as my sashimi just shortly marinated in a special soy mix, fresh and softly sharp because of all the finely chopped scallions. The sticky Japanese rice was amazing especially with the vinaigrette and all in all a proper after workout choice. As a palette cleanser in between all that fish, I ordered the Oshinki Maki (pickles) which I had expected to be that yellow pickled radish. To my surprise I received something green and super crunchy instead which one of the chefs told me was pickled turnip stem. Never had this but it was great and funny because of its’ scrunch with just a hint of sour. I really liked it here and felt a bit special tonight with me as the only guest getting all the attention. The chefs host like gentlemen and entertainers and aren’t shy to have a conversation with you, give a recommendation or suggest customization of the menu items. I’ll come back here anytime if I feel like a treat and don’t mind to pay it as such as ‘Shinzo’ is also not the cheapest of places. Very nice. Premium Wagyu cuts at Boat Quay. I was very happy to receive the invitation to a food tasting from the people behind new ‘Arashi Yakiniku’ 嵐 down at Boat Quay and so made my way down there today directly after work. It is nestled in between the shophouse pubs and restaurants along the riverside, offering in- as well as outdoor seating for a more scenic setting. We were greeted warmly by the staff and shortly after food started flowing to our table. The menu started up with their ‘Wakame Miso Soup‘ (わかめ味噌汁) which had a light delicate broth with some soft tofu bits and seaweed floating around in it. This proofed to be a great palette cleanser throughout the whole meal as well which was perfect to slurp on between the different meats. We also had the ‘Namuru‘, a selection of small vegetable starters like pickled crunchy bean sprouts, squeaky spinach and shimeji mushrooms. Now it was time for the main act and the starting round was a selection of Australian Wagyu cuts (オーストラリア和牛). First we had the ‘Beef Tongue‘ (中落ちカルビ) and I didn’t really know what to expect as I had never tried this before and to be honest tongue also never sounded too appealing to me. To my surprise it was actually super nice to eat and pretty delicious. It tasted much more delicate than I had expected, with a solid and strong beef flavour, fire kissed crisp on the edges but still lovely chewy and firm. Together with the dipping salt and freshly squeezed lemon this was a lot of fun to eat and one of my favourite and most surprising dishes of the entire dinner. After this promising start we continued with more premium cuts – ‘Sirloin‘ (サーロイン) and ‘Ribeye‘ (リブアイ). The sirloin was nicely marbled causing the meat to be wonderfully soft and just melting away in my mouth. The ribeye on the other side had a great charr and a much more robust texture and flavour to it, while still being perfectly tender. Alongside these meats they served their special ‘Arashi Sauce‘ which was refreshingly sweetish and spicy. I couldn’t figure out where the heat was coming from and the chef keeps the recipe very close to his chest so I had to enjoy it unknowingly the ingredients. Normally I wouldn’t touch sauce with these kind of special meats but this was just too good to ignore so I gave it a fifty-fifty dipping ratio. We also had some veggies to go with it all – shitake, leek, pumpkin and asparagus – which even though nothing overly exciting worked nicely together with the other, sesame vinegar sauce and added some nice texture and taste diversion to the meal. Last of the “aussis” was the ‘Harami/Outskirt‘ (牛ヒレ) that had hardly any marbling and therefore was of much darker colour. The flavour had a more solid taste, down to earth, genuine beef, more rustic and familiar, which was a great alternative in between the other more posh cuts. This all has been pretty great already but then the chef did send us some platters of their A4 grade Japanese Ohmi Wagyu (日本のウ牛（和牛)) which gave us a second upwind and excitement. The ‘Karubi/Short Rib‘ (カルビ) had a light taste with a certain nuttiness to it. It was delicious, just the thick streak of fat could have been a bit thinner for my liking but gave it all an interesting chunky texture. Next we got to make the direct comparison between the Australian and the Japanese version as the A4 ‘Sirloin‘ (サーロイン) and ‘Ribeye‘ (リブアイ) came out to our table. The sirloin was the peak of indulgence, so rich and marbly that I reckoned it was best to be consumed in small portions, not to be too overwhelming. Crazy good. Even though I didn’t think it could have gotten much better the ribeye surely proofed me wrong and became my unrivalled winner of the evening. Still madly rich like meaty butter this cut was perfectly separated into three different sections of goodness – from a darker, meatier and deeply beefy tasting piece, over the thick middle section of a pure melt-in-your-mouth streak of fat onto the thickly marbled end piece. Outstanding. All those premium cuts of beef were accompanied by their simple but delicious ‘Garlic Fried Rice/ Ninniku Chahan‘ (にんにくチャーハン). Unfortunately not using the typical Japanese sticky and roundish grains, the rice still had a great bite to it, fragrant and loaded with heaps of fried garlic without being overly oily. Simple and savory comfort food. ‘Arashi’ is a casual place with a minimalistic interior that offers high quality food to moderate prices. We really enjoyed the Australian as well as the A4 Japanese beef cuts a lot and if wished they also can hook you up with highest grade A5 Wagyu, subject to availability and pre-order. A special thanks goes to Roysten for the kind invitation and hospitality and Nikki who helped us grilling our meats so perfectly. Best of success and thanks for a great night of indulgence. I’ll come back. I had been thinking of Vietnamese food for around a week now and so ended up at ‘Viet Inn’ at Boat Quay after a yoga class just around the corner. It was a hot yoga class so I didn’t really feel like a steaming bowl of ‘Phở‘ today and therefore ordered the semi-cold ‘Bún Bò Xào‘ (dry rice vermicelli with braised beef) instead. 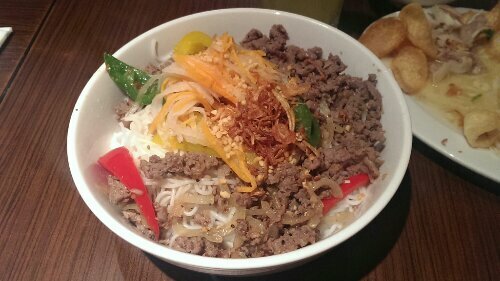 I was starving and thankfully this was not a small portion at all, loads of cold vermicelli topped with more loads of panfried vegetables and beef. The fried veggies and the beef tasted pretty good, they were a tad too oily but mixed up with the rice noodles it was just fine. The Thai basil and fried garlic, the crunchy peanuts and the raw carrots and radish added some extra textures and freshness to the whole thing which disappeared in no time. It’s a normal looking place with no special atmosphere or flair, the service is sufficient and the food was simple but good. Probably not something I would jump in a taxi for but passing by I might be giving that ‘Phở Bò‘ a try sometime. I went to Circular Road for lunch to meet two of my friends and to check out a new Mexican restaurant – ‘El Rocho’s’ – which just opened here not long time ago. First up was the ‘Beef Taco‘ that looked promising when it arrived. Unfortunately the beef chunks were chewy and stringy and reminded me of a cheese steak sandwich from one of the big sandwich chains. The second round I ordered the ‘Chorizo Taco‘ which besides the sausage used the same ingredients as the beefy version – cilantro, chimichurri mayo, lime and veggies but tasted much better. I liked the freshness of the herbs and the seasoning and saltiness of the chorizo. This one worked for me and was much more satisfying. Unfortunately the ‘Fish Ceviche‘ we ordered for sharing was also rather a disappointment.The portion was big and the taste wasn’t bad really. I also liked the crispy corn and crunchy jicama sticks (mexican turnip) in it but the dressing was quite viscous and the fish cut in way too big pieces for my liking. The place is actually quite nicely located around the Boat Quay area and I guess also convenient for the banker’s lunch break and afterwork, the staff was very friendly too but unfortunately the food just didn’t cut it for me this time. They sell ‘Pacifico Cerveza‘ though and some menu items like ‘Ox Tongue Tacos‘ sound pretty interesting so I might come to back some time to check those out.